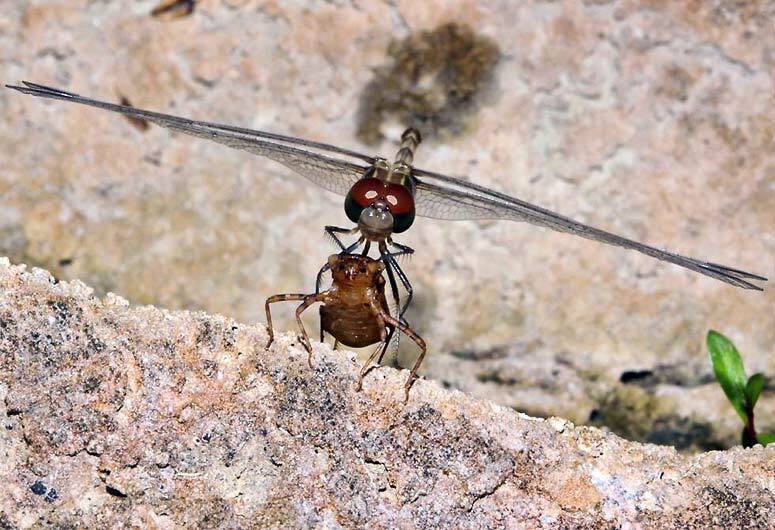 Dragonflies and damselflies spend the early part of their lives underwater as voracious predators, eating other bugs and even small fish and tadpoles. This was the first time I've ever seen them completing their metamorphosis, and I saw not just one but four in this one night at Rio Blanco national park. The newly emerged dragonfly is standing on the moulted shell of the aquatic animal it used to be. It has spread its wings and is waiting for them to dry and harden, so it can start its aerial life when the sun comes up. Emergence is a dangerous time for dragonflies because there are many things which can go wrong while it is getting its wings ready for flight. If it's windy or it rains then the soft wings can be damaged and the dragonfly will be unable to fly, making it an easy picking at dawn for any bird which finds it. Most dragonflies develop their color over a period of time, so this dull-looking newly emerged individual might end up bright red or green.